In a world where brand loyalty is becoming increasingly more important, user-engagement with your unique brand matters more and more. With more and more unauthorized sellers entering the marketplace each day, shoppers don’t always know who they can trust. With Amazon Stores, you not only drive brand awareness, you create a sense of security for users shopping your products. Drive search through headline advertising (allowing you to market to more qualified buyers) and social media. Encourage word of mouth advertising through social networks. Feature dynamic or hand-picked products from your inventory along with multimedia content to enhance the shopping experience. Create interaction with a wider audience through social features like share buttons and promotional extensions. 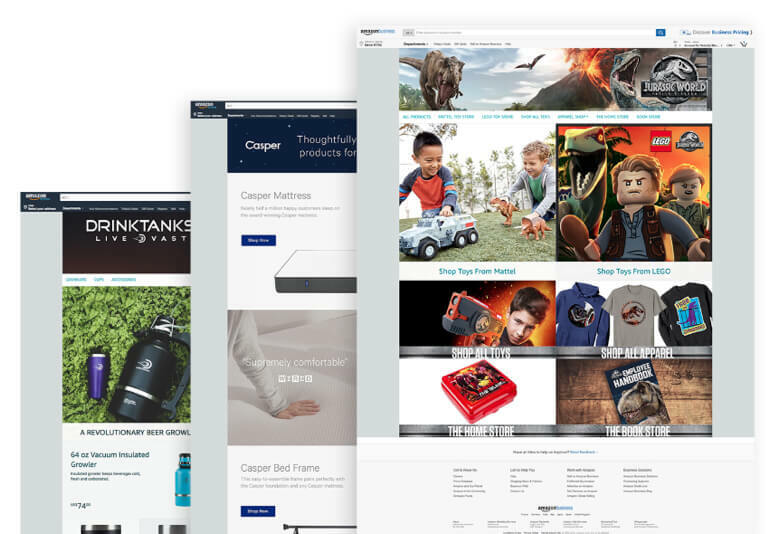 With brand page setup through Zanoma, you’ll never have to go it alone - our team will work with you to implement professional, brand-accurate store pages that showcase your products and features. We get to know your brand, style guides and target demographic in order to meet your unique business needs. Our team audits your inventory and creative assets to develop a page structure which focuses on highlighting your products, imagery and copy. Our Creative Services Specialists will implement a custom layout designed around your unique style guidelines, brand voice and provided assets. Your days spent tirelessly sorting through data are over — think bigger. Think Zanoma.